Our stocks are one of a kind and have allowed us to offer many services to many different sizes and types of equine patients. They were designed and built by Dr. Cotterill, carefully guided by Hornback Custom Welding. These stocks provide extra safety for the patients and those around them. These stocks were designed so that they are able to expand and accommodate draft horse dimensions or restrict down to the size of a small foal giving all sizes of animals stability, restraint, and above all SAFETY. Not only do both sides open, but it is equipped with twenty gates so that any portion of the horse may be exclusively exposed leaving the rest of the horse protected and restrained. Pictured above is the practice portable chute. This Silencer Hydraulic Chute is equipped with digital scales, a movable control arm, dual palpation gates, a hydraulic head extender and manipulator, a breast bar, front or side exits, and ten feet of adjustable heavy duty alley. The generator that powers the chute is powered by gasoline, and has 40 ft of hose to remove noise from the working area. 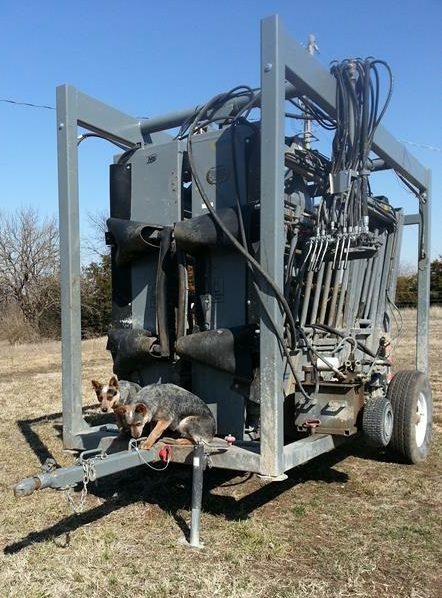 The use of a hydraulic system has been shown to reduce processing time by 40-50 % over a manual system therefore reducing stress on the animals, cutting labor cost, and SAVING YOU MONEY while at the same time adding safety. We would appreciate the opportunity to process your cattle and demonstrate it’s efficiency and ease. Pictured above is a Silencer tip hydraulic chute, it is preceded by 30 feet of hydraulic controlled alley that allows for width adjustment. 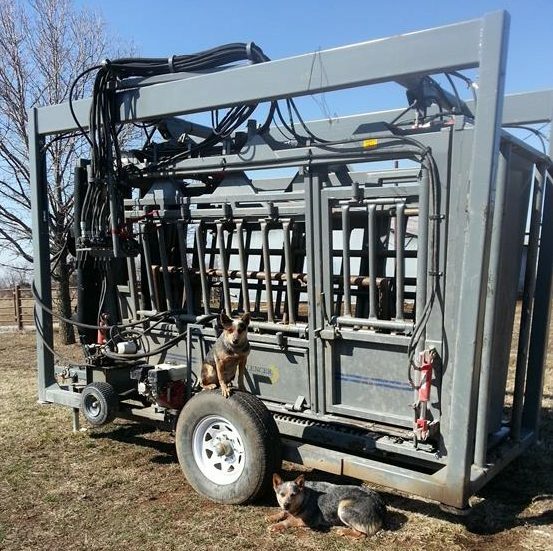 This system allows for quick and safe handling of your cattle reducing stress on both the animals and the people involved in treating the animals. This chute is able to take the LARGEST of herd bulls and tip him on his side allowing for easy access to his feet. We also are equipped with all power trimming equipment allowing us to address both diseased foot treatment and regular foot trims quickly.